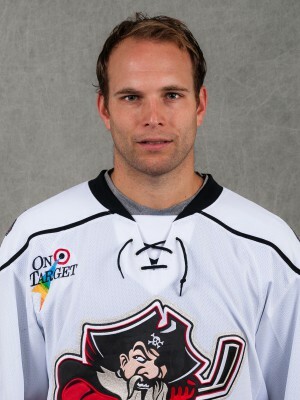 Rob Schremp, as pictured on PortlandPirates.com where he currently plays as center for the AHL team. SYRACUSE – Current AHL hockey player for the Portland Pirates and Fulton native, Rob Schremp returned to his roots for the 2016 AHL All-Star Weekend (Jan. 31-Feb. 1) at the Syracuse War Memorial. Starting with the AHL All-Stars Skills Competition yesterday (Jan. 31) Schremp performed for the All-Stars East division in the rapid fire event, the pass and score event and the breakaway relay. Despite some fun showmanship in the breakaway relay and a goal by Schremp in the pass and score event, the East lost the skills competition with an overall score of 19-14 in favor of the All-Stars West. Portland Pirates center, Schremp is competing as one of 13 AHL players in the Atlantic Division of the All-Star Tournament that takes place tonight (Feb. 1) at 7 p.m.
Schremp returned to Syracuse in November of 2015 for a game against the Syracuse Crunch in which he contributed one goal in the game, and his seventh goal of the season, in the Pirates 4-1 victory. So far in this season with the Pirates, Schremp has 17 goals and 16 assists to total 33 points. Schremp, who says he first started playing hockey at age 4 in his Portland Pirates players profile, has found home on many teams in many different divisions in his hockey career. Starting with a junior career with the Syracuse Crunch, he then found opportunity in Canada as part of the Ontario Hockey League where he earned the title of OHL Rookie of the Year in the 2002-2003 season. After leading the OHL in regular season scoring with 57 goals and 145 points in the 2005-2006 season, Schremp caught some attention in the United States and eventually made his NHL debut stateside in 2007 with the Edmonton Oilers. Debuting with the New York Islanders in 2009, Schremp scored his first NHL goal in December of the same year in a game against the Boston Bruins, eventually ending the season with seven goals and 25 points. Becoming an unrestricted free agent in 2011, he signed with MODO in the Swedish Elite League debuting his overseas career with 19 goals and 41 points in his first season. He then split the 2012-2013 season between the Dynamo Riga of Kontinental Hockey League in Russia and the Red Bull Salzburg of the Austrian Hockey League before signing with the Swiss National League A and eventually in 2014 joined the Swedish Hockey League. After four years of playing abroad, Schremp returned to the United States for the 2015-2016 season as part of the AHL for the Portland Pirates, an affiliate of the NHL Florida Panthers team. Schremp continues, saying the dynamic is much different being back in the United States as he has the support of his family and friends again as he did before he left for Europe. “I went back to Syracuse (last week) and we had 400 people in the stands. I was used to having that kind of support and friends around so being in Europe it was just hard being far from home” he added. A full version of the player profile as posted on the team website is featured below. Schremp will play in the AHL All-Star Tournament tonight starting at 7p.m. at the War Memorial in Syracuse before heading back to Maine for a home game on Feb. 5 with the Pirates.